Chapman, Paul (2017) Art of Possible: AR/VR Trends and Futures. In: Art of Possible: AR/VR Trends and Futures, 3 July 2017, The Lighthouse, Glasgow. Calling all Design Thinkers, Technological Innovators, Artists, Scientists and Civic Entrepreneurs! Are you interested in how next generation technologies can help us tackle societal challenges, and live better lives? 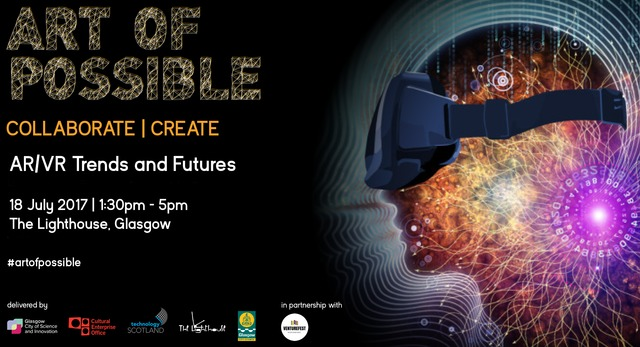 The Art of Possible is a movement bringing together Scotland’s creatives, policy-makers and STEM professionals to consider civic uses for the regions’ world-leading emerging and enabling technologies. An official Feeder session for Venturefest Scotland – the national innovation summit; the tech focus for our July Event will be virtual and augmented reality which are proving to have applications across a range of diverse sectors from health, construction and engineering to fashion and film-making. There are some ground breaking businesses and researchers right here in Scotland including our keynote speakers, Dr. Paul Chapman, Head of the School of Simulation and Visualisation(SimVis) at Glasgow School of Art and Peter Dobson, CEO of Eventual VR, who are leading the way in Scotland’s AR/VR capability. As a group we will redefine the “art of possible” by broadening of our understanding and perspectives on enabling virtual reality in the real world; sharing resources, sparking creative ideas and supporting creative collaborations to innovate for society.